My desperate psychological need to feed people makes me obsessive over whether or not my friends and family eat breakfast. In my previous jobs, I used to have a small breakfast delivery business where I catered meals to my colleagues every working morning, delivered hot on their desk. Making hot breakfasts from scratch 5 days a week for 3-4 people is just not feasible anymore now that I have a baby who tends to get very active around 5:30AM. Still, I am concerned whether or not my husband feeds himself in the morning. Hence, the reason for these breakfast pastries. 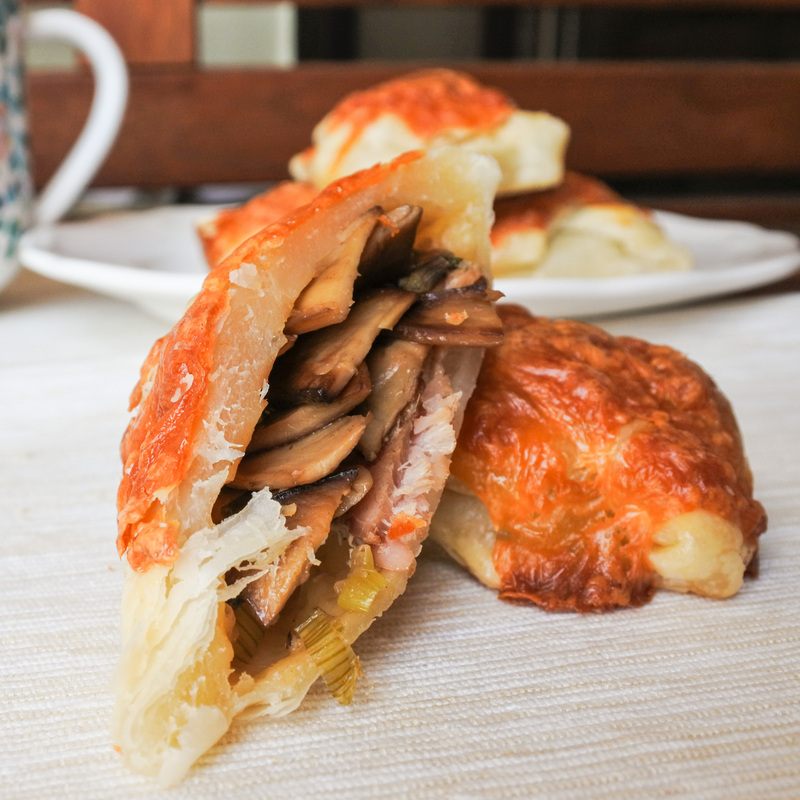 A British classic of mushrooms, bacon, shallots and Worcestershire sauce bundled in buttery puff pastry and topped with a sprinkle of cheese is difficult to refuse. These ‘Mushroom on Toast’ pastries are perfect for brunch or package them up for a breakfast on the go, I guarantee that you’ll want to be eating these all week long. Wash and thinly slice mushrooms. In a large saute pan, melt butter over medium/medium high heat, add shallots and mushrooms and let cook until soft and brown. After mushrooms have browned, turn off heat. Add Worcestershire sauce and chopped scallions and mix together. In the center of the puff pastry square, stack 2 squares of bacon in the center. Spoon a heaping tablespoon of mushroom mix on top. Next, fold side corners in, followed by bottom corner up and top corner down. Brush with beaten egg and top with a sprinkling of shredded cheese. Bake in the oven at 450F/220C for 30-35 minutes or until crisp and brown. Perfect when paired with a strong cup of tea or coffee. In a large saute pan, melt butter over medium/medium high heat, add shallots and mushrooms and let cook until soft and brown. After mushrooms have browned, turn off heat. Add Worcestershire sauce and chopped scallions and mix together. Fold into a little parcel. Bake in the oven at 450F/220C for 30-35 minutes or until crisp and brown. Perfect when paired with a strong cup of tea or coffee.